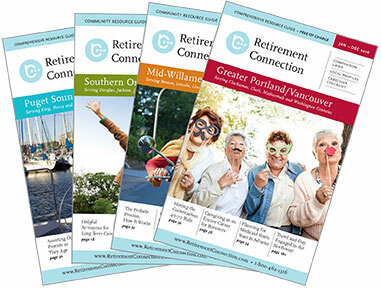 We are excited to welcome a new team member to Retirement Connection. Kyle Manning joins our team as a Marketing Coordinator and will support our outreach efforts with e-mail marketing, web support, and administrative help. You may not see him out and about as often as our other staff, but I assure you he is hard at work and an awesome addition to our Retirement Connection family. Kyle was already helping as a volunteer at the Memories in the Making event prior to his start date. Awesome! With that- we wish Claudette much success in her next chapter, as she was an important part of our growth in the past year. Other Big News- We are excited to be working with SAGE and adding an additional question to the housing grids in the guide labeled “GLBT Designated” in hopes that it will highlight more choices for the GLBT older adult consumer when shopping for safe, welcoming housing. Click here for more details. Please remember that we want to be more than another print guide. The 3 dots of our logo represent: the guide, website, and network. Let us find more ways to network and be a resource for you and your business.